Posted on 17, January 2019 by EuropaWire PR Editors | This entry was posted in Electronics & Machinery, Germany, Technology and tagged battery chargers, diodes, drives, Infineon Technologies, starters, switches, thyristor, windmills. Bookmark the permalink. With its proven reliability and functionality, the Eco Block offers the best value for money for a 60 mm pressure contact module in the market. 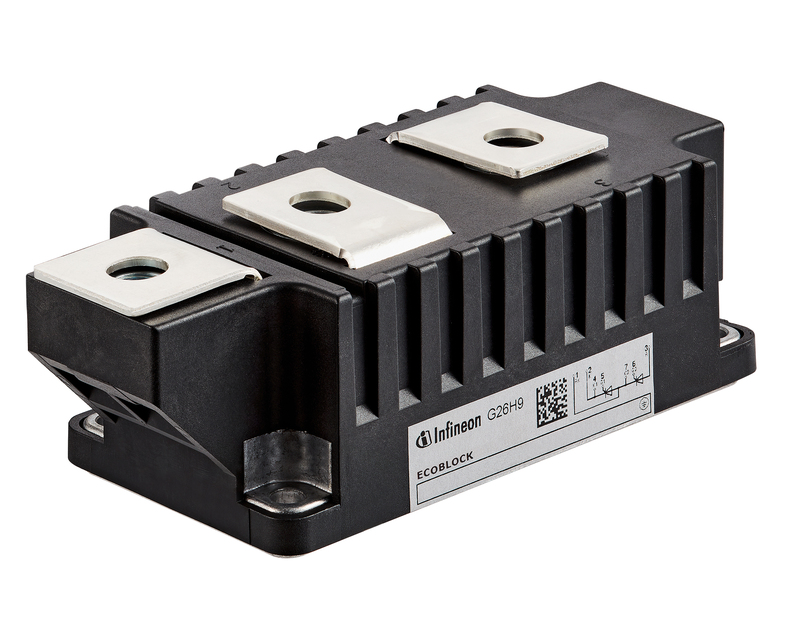 MUNICH, 17-Jan-2019 — /EuropaWire/ — Infineon Technologies Bipolar GmbH & Co. KG has redesigned the product portfolio of 60 mm thyristor/diode modules with pressure contact technology. The new Eco Block family addresses the demand for cost-efficient larger modules for battery chargers, static and bypass switches and windmills. Additionally, the modules are a perfect fit for soft starters as well as rectifiers for drives and uninterruptable power-supply (UPS). Due to its higher junction temperature, they are aiming at applications with air-cooled designs. The new 60 mm Eco Block family with pressure contact technology is available in high quantities. All modules are offered in the topologies thyristor/thyristor and thyristor/diode with a blocking voltage of 1600 V or 2200 V and in current ratings from 420 A to 630 A. Additional module types in 70 mm are planned for release in the course of 2019. For an optimized performance and keeping customer´s production fast and clean, the next portfolio extension will be pre-applied Thermal Interface Material (TIM). More information about Infineon’s Eco Block family is available at www.infineon.com/ecoline. The Eco Block modules feature all essential functions and make use of the pressure contact technology while stripping down costly extras. They provide best-in-class thyristor and diode blocking stability leading to high reliability and an outstanding lifetime. The pressure contact technology guarantees a short-on-fail feature, which in return prevents arcing. This allows for simplified safety designs in terms of unit shielding and fusing effort. Infineon Technologies Bipolar offer the new 60 mm modules with a high overload capability. Combined, these features help to minimize failure rates and reduce system cost. With its proven reliability and functionality, the Eco Block offers the best value for money for a 60 mm pressure contact module in the market.